Tile Pro of Seattle is aware that not every project is the same. Some projects may require more time, skill and knowledge than others. We are proud to provide professional services in Granite Slab Countertops, Heated Tile Flooring, Custom Shower Doors, Custom Shower Pans and we are also experts in Custom Tile Design installations. Call us today! We install granite slab countertops! Create an immediate impression of elegance with Granit Slab Countertops. Granite is sold as 12 x 12 tile or as a slab. Granite is frequently used for kitchen countertops, bar tops, and vanities in bathrooms. Tile Pro of Seattle is experienced in fabricating and installing either slab or 12 x 12 granite tiles. We install heated tile flooring! Turn your dream tile project into a reality! Tile Pro of Seattle offers our clients the opportunity to have heated tile flooring installed in any part of their home. You can enjoy the luxury of walking on a warm tile floor. Heated flooring is installed below your tile, therefore making it safe, quiet, energy efficient, clean and hypoallergenic. We build custom shower pans! Most tile contractors sub-out the building of shower pans. Tile Pro of Seattle has the experience to take on any project, from start to finish. Building a custom shower pan can be complex, but we have 100% confidence in our technicians to properly build any shower pan. 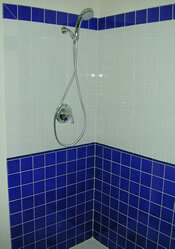 Tile Pro of Seattle guarantees you a beautiful, leak free shower pan. We install custom tile designs! We install tile on custom tile designs. If you have a particular tile design in mind or you’ve seen a tile design that was completely breath taking, Tile Pro of Seattle can bring that to life in your home. We install custom shower doors! 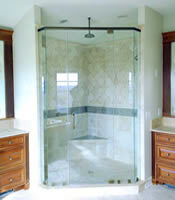 The final touch to any custom shower project is an impressive glass enclosure. At Tile Pro of Seattle, we are here to assist you with any custom project, from start to finish. Our custom shower glass is professionally installed to your liking. Q: Can I incorporate two or more materials? Such as granite with a stainless steel accent? A: Yes. Tile Pro of Seattle’s expert technicians can install any materials you choose. Q: What size tiles should I install on my shower floor? A: Most tile contractors would agree that the smaller the tile, the better when it comes to shower floors. Tile Pro of Seattle recommends nothing larger than 4 inch squares. Thank you so much Tile Pro of Seattle! Your Grout technicians totally live up to your name. The BEST service I've had by far. The shower door really was a good idea. Thank you Tile Pro of Seattle, you guys do amazing work.